You don't normally see people breaking INTO educational buildings in New York. 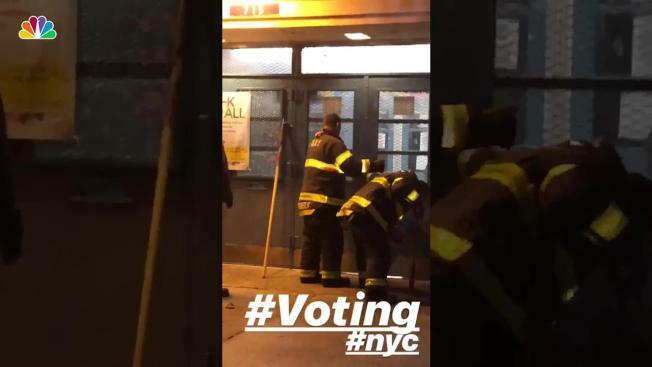 That happened Tuesday, when the FDNY was called to pry open a door after a poll worker locked him- or herself in between the inner door and the outer door of the school on Election Day. Resident Jalessa Parris posted two videos to Twitter showing firefighters using heavy duty tools to pry open the doors to Cooper Union's Breukelen Community Center in Canarsie. Parris said she got to the polling spot around 6 a.m. and people were already leaving, having thrown up their hands over the locked entrance. Firefighters got the doors open a little before 6:30 a.m., her video showed, and people started filing in. Parris said she left and came back about an hour later to give time for more poll workers to arrive. By 8 a.m., someone showed up with the right key -- and she was able to vote by 8:30 a.m., two and a half hours after she initially showed up to cast her ballot. An FDNY spokesman confirmed the department got a call at 6 a.m. to open the doors after the poll worker became trapped. Initial reports indicated the polling location itself was locked, but the FDNY clarified it was a worker who was trapped between the doors in the vestibule.